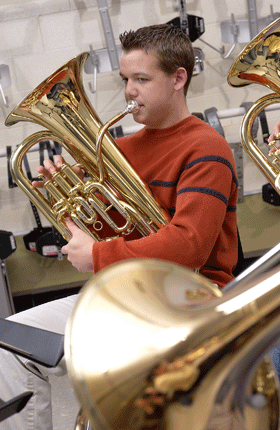 We specialize in renting new, like new, and used instruments to students of school band and orchestra programs in Lee, Charlotte, Hendry, Collier and Sarasota counties. All of our used instruments are cleaned, tuned, and adjusted to play like new and most are in excellent cosmetic condition. For your convenience - make a payment or view your account history online. Renting an instrument from us is easy! Or click here to rent your instrument online! All rentals are on a month to month basis and rental principal payments apply towards purchase of the instrument with no finance charges or hidden fees. Cadence Music is also the only factory authorized dealer and service center in SW Florida for such brands as: Yamaha, Selmer, Bach, Buffet, Jupiter and many others. There's no obligation to buy - you can return or exchange at any time. Pay off your instrument at anytime during the rental agreement and receive a 30% discount off the remaining balance. Want to switch instruments? No problem! We will apply up to 100% of the rental principal towards another instrument. We offer an optional M&R (maintenance and replacement) coverage on all rentals, as well as purchases, for your protection. Convenient weekly pick up and delivery to Lee, Collier, Charlotte and some Sarasota County schools. We are the only store that visits almost every school in Lee, Collier and Charlotte County every week during the school year. Fast and professional in-house repair shop that services students and professional musicians from around the world. We own all of our instruments and we are not an outlet for another company. If you have a problem, we take care of everything right here with no hassles. Also, since we are 100% locally owned and operated, all money stays right here in SW Florida supporting the local economy!